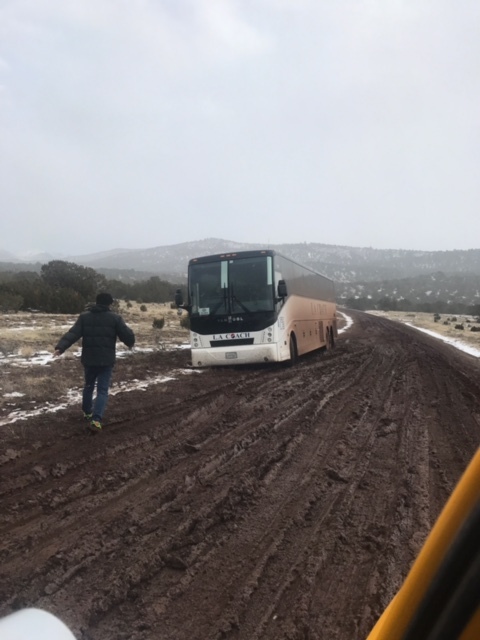 Coconino County, Arizona — Plans to return home from a trip to view the Grand Canyon were delayed over eight hours for 44 Korean tourists including children, when their tour bus became stuck in mud along a remote forest service road during a snow storm on Monday, January 23, 2017. The Arizona Department of Public Safety (AZDPS) received the 911 report at 4:00 p.m. and state troopers located the tour bus along Forest Service Road 417, about four miles northeast of SR 180. This junction is about 20 miles southeast from Valle and about 30 miles northwest of Flagstaff. The bus driver told troopers he was traveling to Page, Arizona, southeast along SR 180, when he decided to transition to an alternate route recommended by a GPS device due to the winter storm and roadway conditions. The alternate route was Forest Service Road 417, which cuts through the remote Coconino National Forest. The route would have bypassed traveling all the way to Flagstaff along SR 180. The driver said he decided to turn back towards SR 180 when he realized the road was not safe; that is when the bus became stuck in the mud. An attempt to move the bus with a heavy duty tow truck failed due to the poor conditions. 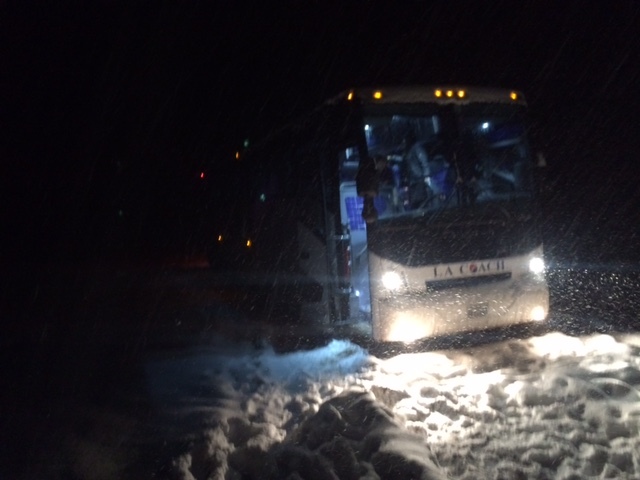 Although freezing temperatures, snow fall and darkness began to set in, the tourists were able to keep warm because the bus was topped off with fuel which allowed the bus to continue operating while waiting for help. ADOT plowed the snow off of SR 180 in order to clear an access route from the scene to the command post which was located near the junction of SR 180 and FS 417. Troopers and a citizen began shuttling the Korean tourists and the bus driver in their vehicles to the command post. A Williams School District bus transported the tourists back to Valle were lodging accommodations were made. The rescue efforts were executed by a citizen who stopped to assist, DPS, Coconino County Search and Rescue, Arizona Department of Transportation (ADOT), and the Williams Unified School District. AZDPS reminds the public to be wary of traveling on a dirt road as an alternative to a highway since highways are regularly maintained and patrolled by authorities; dirt roads or back roads may not be maintained during the winter.